Cherry Hill-based Professional Podcasts LLC (www.professionalpodcasts.com) is producing podcasts this week at the Top Management Conference of NAPL, the trade association for excellence in graphic communications management, in Santa Barbara. 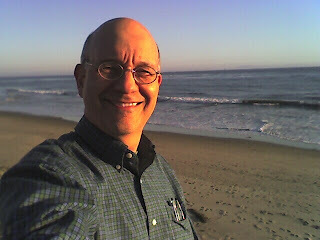 Here I am enjoying one brief moment of sunset by the Pacific Ocean, which is right across from the Four Seasons Resort where the conference is taking place. Completing a podcast recording at the NAPL Top Management Conference are (from left): Maudie Briggs, president of Morrison Communications, Morristown, TN; Jerry Mechell, president of Swifty Printing, Arlington, TX; Joe Truncale, president and CEO of NAPL, conference host organization; and Don Bergeron of Daily Printing, Plymouth, MN. We’ve been producing podcasts for NAPL for nearly a year now, and this is an organization that truly gets the value of podcasting for delivering their intellectual content to a highly focused and information hungry audience. Our approach to podcasting is different than many podcasters. We regard this as a serious communications tool that can be used by business organizations to reach audiences with structured, informative content. When properly produced (like long-form public radio programming) podcasts can deliver content to dispersed audiences on a time schedule convenient for them, and at a cost for production that is dramatically lower than other media. You can listen to the podcasts at NAPL’s website or subscribe to the feed. You can also visit our websites, www.lubetkin.net or www.professionalpodcasts.com, to see the complete selection of podcasts we are producing for clients.